Towson dropped two of three games to Colonial Athletic Association (CAA) opponent UNC Wilmington at Brooks Field in Wilmington, North Carolina. On Sunday, the Tigers (12-27, 5-7 CAA) dropped the series finale to the Seahawks (24-15, 7-5 CAA) 5-1. In the first inning, the Tigers got on the board when senior infielder Billy Lennox doubled to score senior outfielder Colin Gimblet. In the bottom of the fifth inning, the Seahawks tied the game on an RBI double. They broke the game open in the seventh inning after plating three runs. The team added an insurance run in the eighth inning to secure the 5-1 win victory over Towson. Senior pitcher Michael Adams (3-4) took the loss after allowing four runs on eight hits over six innings. 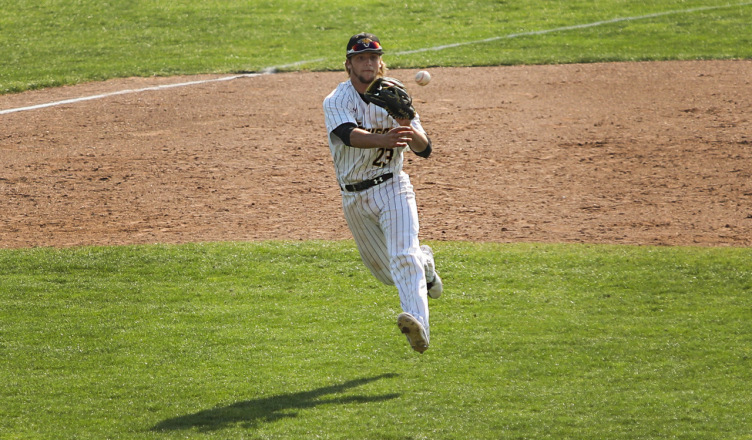 In Saturday’s game, the Tigers took advantage of early errors to rout the Seahawks 14-3. In the top of the first inning, junior infielder Craig Alleyne scored after a throw went into centerfield. Redshirt junior outfielder Mark Grunberg scored on a fielder’s choice, and junior infielder Richard Miller doubled to score another run. In the top of the second inning, Gimblet doubled to score two runs. Lennox followed with a single to score Gimblet. Later in the inning, senior infielder Logan Burke delivered a bases-clearing double to give the Tigers an early 10-0 lead. Sophomore outfielder Andrew Cassard bloop singled to score Burke in the sixth inning to add to the lead for the Tigers. UNC Wilmington got on the board in the bottom of the seventh inning with the help of two Towson errors to plate three runs. The Tigers answered back in the top of the eighth inning when Palacios scored on misplay by the Seahawks. Lennox followed with an RBI double to plate another run, and then scored on a single by junior infielder Richard Miller. Senior pitcher David Marriggi (3-4) earned the win after allowing three runs on six hits over seven innings. On Friday, the Tigers dropped the series opener 5-2. In the bottom of the third inning, the Seahawks took advantage of five walks to score four runs. They added another run in the fourth inning to extend to their lead. Alex Cuas (0-3) took the loss after allowing five runs on three hits and seven walks over four innings. On Wednesday, two home runs helped Towson defeat Delaware State 6-2 at John B. Schuerholz Park. The Hornets (5-29) jumped on the board in the top of the first inning, as they plated two runs on two RBI groundouts. In the bottom of the third inning, Palacios delivered a solo homerun to get the Tigers on the board. Later in the inning, Alleyne singled to score two more runs to give the Tigers a 3-2 lead. In the seventh inning, Burke delivered a three-run home run to secure the win. Freshman pitcher Josh Seils collected his first-career victory after allowing two runs on five hits in five innings. On Tuesday, two errors in the ninth inning allowed University of Maryland, Eastern Shore, to push past Towson. The Hawks (9-28) took an early lead after scoring two runs in each of the first two innings to take a 4-0 lead, but the Tigers offense scored score seven runs in the fourth to take a 7-4 lead. UMES scored a run in the fifth and seventh innings to pull within one run of Towson, but Palacios singled in the eighth and scored on a throwing error to extend the the team’s lead. In the top of the ninth inning, the Tigers committed three errors to allow the Hawks to score nine runs and win the game 15-8. Junior pitcher Gavin Weyman (0-7) took the loss after allowing four runs on five hits, while in two-plus innings of work. “On Tuesday, we came out a little flat,” Tyner said. The Tigers will travel to face University of Maryland, Baltimore County, Wednesday at 6 p.m. before staying on the road to take on Northeastern in a three-game series over the weekend. First pitch of game one in that series is set for 2:30 p.m Friday.